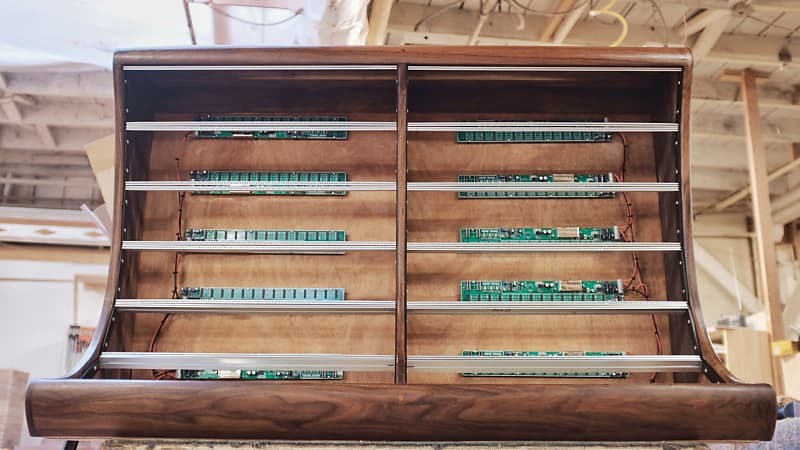 We'd like to introduce you to the latest option in our line of Eurorack cases, the double-wide 21U. A divider can be added to any case wider than 168HP to separate the sections and add rigidity to the structure of the case, and give you up to 336HP (if I did my math correctly). These are made to be the centerpiece of a studio. Every detail was fussed over to ensure it will inspire creativity and give your space an unparalleled "wow factor". They're fully handmade with bomb proof joinery & finished with hand rubbed varnish. There's absolutely nothing like them on the market. 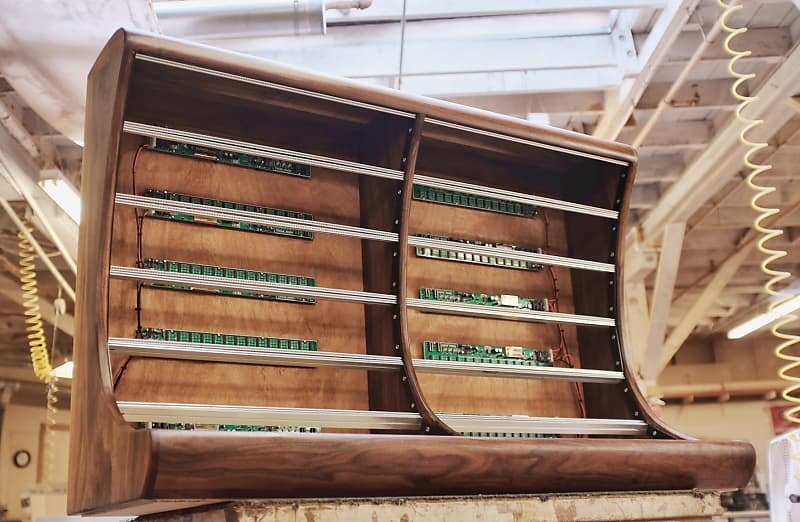 The selling price includes the cabinet, installed brackets & rails w/ threaded inserts, all PSU related hardware (switches, jacks, etc), and installation of any PSU. I’ve had custom brackets for the rails fabricated in black, which will help hide any gaps. Will make a custom blank panel for any open rows if you are still growing into a case this size. 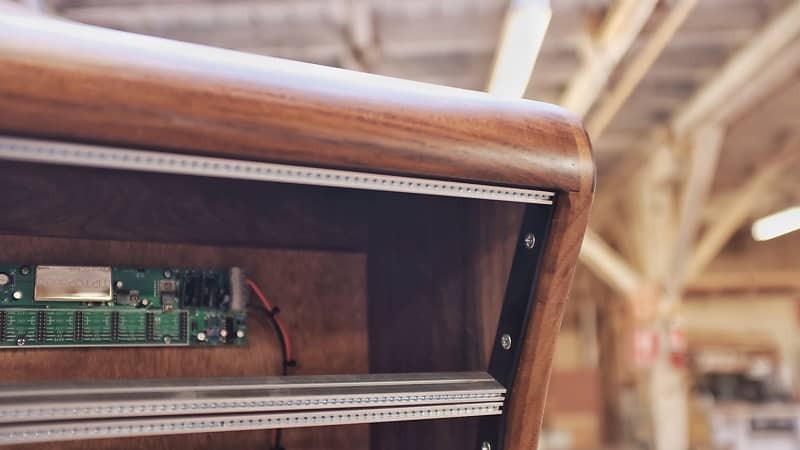 Needham Woodworks is an independent fine furniture design studio in San Francisco, CA, focused on building high-end studio cabinets for modular synthesizers. 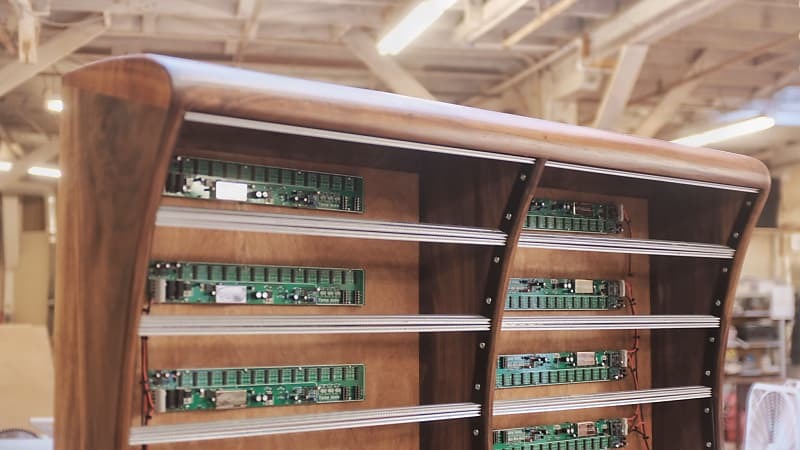 The cabinets are built in small batches with each batch showcasing a different design element and/or construction technique, and each case within a batch is unique, as they are each shaped by hand from sketches done on the raw lumber before they are cut. 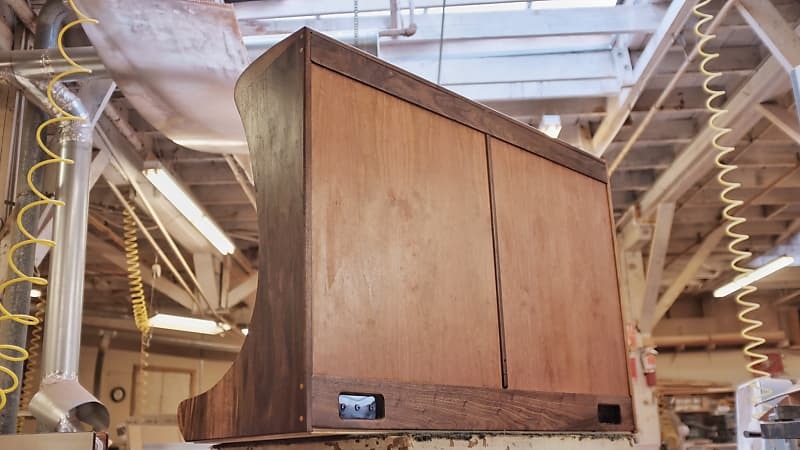 Each case, up to 15U, feature exposed hand-cut dovetails and other traditional joinery techniques. 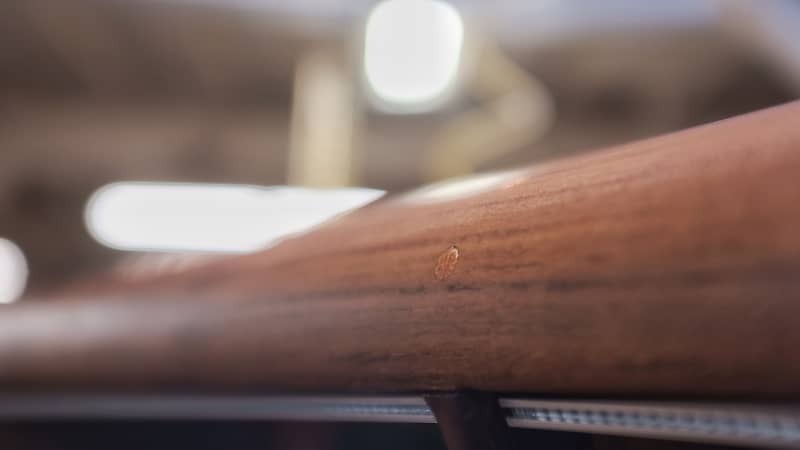 Each case is finished with ~7 coats of hand rubbed oil varnish to bring out the grain in the walnut, and top with our wax blend to enhance its luster. Each case gets about 40 hours of attention, starting with the selection of wood to the final burnishing of wax before shipment. 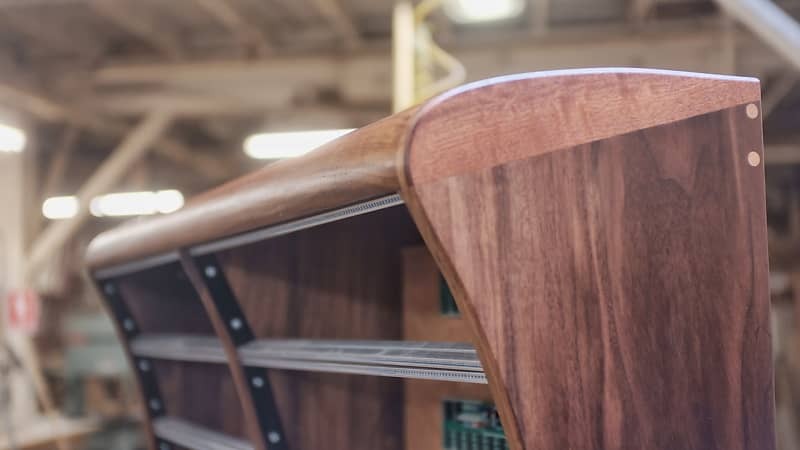 All cases, unless otherwise specified, are made from fully sustainable black walnut felled near Portland, Oregon. We hand pick each board from giant flitches of rough lumber and do the final milling/dimensioning/smoothing in our shop. All our cases ship with Vector rails installed with threaded M2.5 inserts, but you can have M2.5 sliding nuts installed at an upcharge. M3 inserts & sliding nuts are available, but with an additional lead time & additional upcharge since we do not keep these in stock. We've spent a considerable amount of time refining our shipping process & packing techniques to make sure they are delivered to you without any issues. They're impervious to inclement weather and the rage of a disgruntled UPS employee. The amount of packing material is substantial, so we do add a $30 handling charge to the actual shipping costs. Shipping charges will be calculated once they are boxed since the final weight will not be known until then. If you're local to the San Francisco Bay Area, pick-ups are welcome and encouraged! 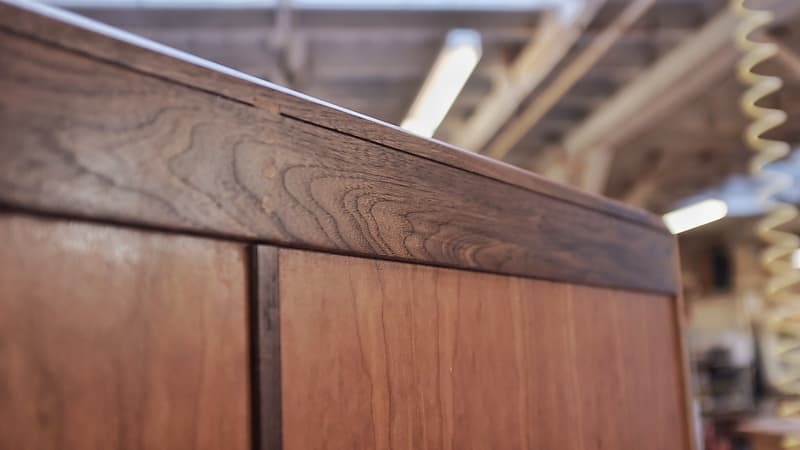 A pick-up includes a tour of our impressive woodworking shop, the oldest dedicated woodworking space in San Francisco. I will be sending photos throughout the build process. Once the completed design is approved, there are absolutely no returns. Based on purchase price of $3,200 at 10% APR for 12 months. Excludes tax and shipping fees, to be calculated at checkout. Rates range from 10-30% APR. Choose from 3, 6, or 12 monthly payments.